The feet and ankles play a primary role in the support and mobility of a person’s body. Injuries to the feet or ankles can be debilitating and dramatically affect one’s ability to perform otherwise simple day-to-day tasks. At our podiatry office, we help our patients through the entire rehabilitative process. Our goal is to pinpoint the source of foot and ankle traumas, such as fractures and sprains, and see them through to recovery. that more than 25 percent of the total bones in your entire body are located in your feet and ankles? There are also 33 joints and more than 100 connective tissues in each foot. These bones, joints and ligaments help facilitate movement, allowing the foot to move and contort as needed. What are the signs of a foot or ankle trauma? Pain and swelling are the most obvious signs of a foot or ankle trauma. 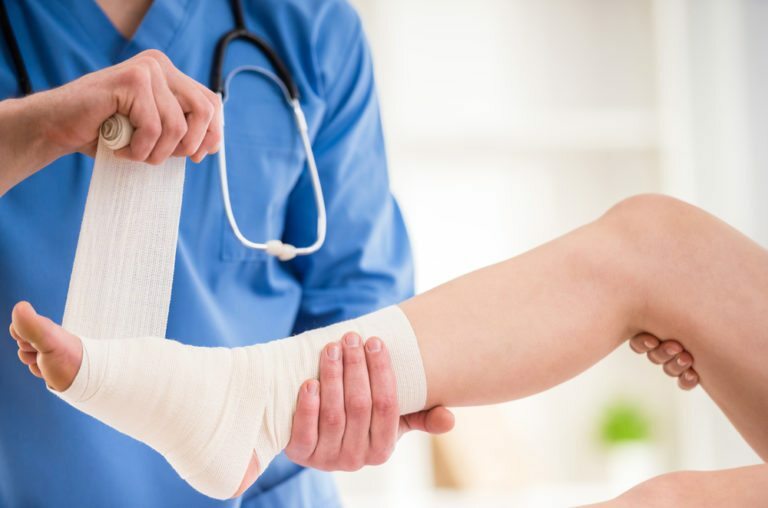 If you have fractured your foot, it is likely that you will experience some pain and swelling, as well as some bruising. Depending on the extent of the fracture and where it is located, you may be able to walk or limp, though doing so may worsen the pain. If you break your ankle, the pain will be sudden and severe, preventing you from putting any weight on the affected ankle. You may also notice a visible dislocation or deformity, as well as some swelling and bruising. How will a podiatrist treat a foot or ankle injury? Treatment for a podiatry injury depends on the type and extent of the injury. The first step is always to rest the injury and apply ice while keeping it elevated until you can see a doctor. Some foot and ankle injuries require surgery, whereas others may only require a cast or compression. All foot and ankle injuries require a period of rest, during which time a patient must refrain from applying pressure to the affected foot or engaging in strenuous activity, such as exercise or sports. Rehabilitation may be necessary for injuries that have caused a tightening or inflammation of the muscles and ligaments. How can I prevent a foot or ankle trauma? It is impossible to prevent all foot and ankle traumas, but there are preventative measures you can take to avoid an injury. Start by wearing supportive and well-fitting shoes on a daily basis. Many people wear supportive shoes when exercising, but change into dangerous pumps or flip flops for daily wear. It is just as possible to sustain a broken foot after tripping in high heels as it is to during a workout. Stretching and proper training are also important for preventing foot and ankle injuries. Talk to your podiatrist before starting a new workout regimen or activity – especially if you have been inactive for a while. An exam can reveal whether your feet are healthy enough for activity.